Here is Michael's playlist in honor of Chris Cornell. If you're in the mood for several hours of good music, free; consider checking it out. On the topic at hand, I'm with Bono. Although in light of U2's work over the last decade, his remark does come close to the pot calling the kettle black. Message fic rears its ugly head again; this time in the record industry. Only four rock/pop acts have managed to reach the pinnacle of popularity and stay there: Michael Jackson, Madonna, Metallica, and U2. These are the last megastars. All of them rose to prominence in the 80s. One is now dead. The self-sabotaging structure of the record industry ensures that no one is coming up to replace them. Incidentally, if you're interested in science fiction that puts fun before message, it just so happens that I've written a few books in that vein. Why does the music industry self sabotage? Is it due to its shady beginnings. Extreme greed? And does the publishing industry share some of the music industry's dysfunctionality? I'm not Brian, but I have my opinion. They're not self-sabotaging. The industry really has absolutely no idea what they're doing. They've never been able to gauge trends or hits. This is why they manufacture pop artists, double down on payola, and buy ad space for their slop on television. This is the best way they have to make sure they are guaranteed control with as minimal effort as possible. The easiest way to stop them is to, as an old band once said: Turn the Radio Off. They choked the life out of their very industry in order to maintain dominance. Actually, yes, it's very much like the publishing industry. The music corporations don't care about music. They care about profits. And mega-super-duper-stars are more profitable than run of the mill decent musicians. It's far more cost effective to put together one megastar group, promote them, and then get the massive profits off of them than it is to get low margins off of a thousand individual talented musicians. This creates a ton of perverse incentives. For example, it's actually counterproductive to find new, good acts... because they just leach airtime from your megastars, and they cost you a lot of money. You don't want radio stations to play indie stuff - you just want them to play your stars. Etc. It's a short-term big payoff that has nasty long term consequences. You make a ton of money while your industry as a whole dies. But you're crying all the way to the bank, so you don't really care. I am Brian, and I endorse these messages. I actually popped over here to leave another comment on your last post on this topic, and I found the Michael Jackson picture to be particularly appropriate. 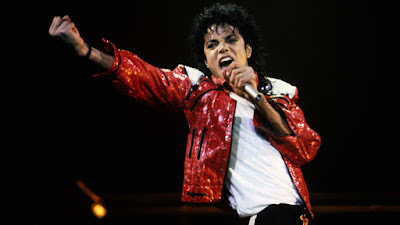 Every single time a Michael Jackson comes on the radio lately (a not rare but not common phenomenon for me - I have very eclectic musical tastes, and still listen to actual radio in my car), I'm struck by how deep the music is. the best of the best of the best played with him. And that's still not all. Listen to the lyrics. "Beat It" is, again, a good example. It's got a hint of danger and a hint of bad boy in it. But ultimately, the song is about Michael trying to escape from the 'hood, and the destruction. Or listen to "Billie Jean" - the song has a hint of the lurid, but ultimately it's about the destruction that going down the path of promiscuity would bring. This was pop music. Today's pop music is all about the threesomes of Last Friday Night... and that we'll do it all again this Friday night (just to pick one example). There's no introspection, there's no self-awareness. Today's hip-hop is about embracing the 'hood, not escaping it. And more's the tragedy that this man who did it lived such a wretched, lonely, tragic existence of his own. The evidence today shows that Michael Jackson was never completely whole - but by the end, he was a broken shell of a man. Such a waste. Today, if you get out of pop, you can still find plenty of depth in modern music. But in pop music? It just ain't there. There is noone in today's pop music with even a tenth the talent that Michael had. Too true. What's more, which pop artists of today would walk their talk like Jackson did by actually having members of the Crips and the Bloods in his video? None. I can't imagine Justin Bebier doing that for example. Thanks guys. So has the Internet help level the playing field somewhat or has nothing changed? I understand about megaprofits. Prince before his death supposedly lost his temper and ranted of why should he work for a music exec so he can spend a day on the beach with while the singer was slaving away earning a misery. I suspect that Prince really understood the music industry and loathed it accordingly. But do the youths really listen to the radio?